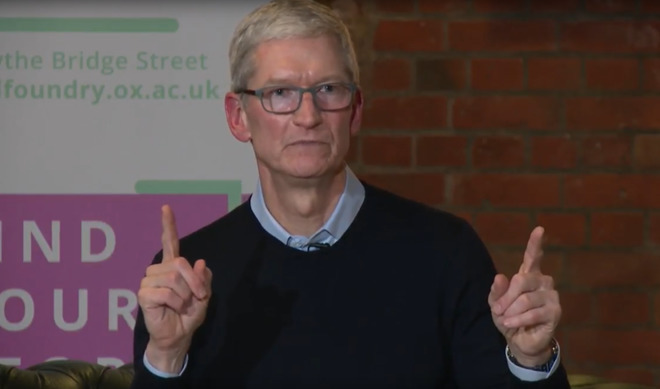 Apple Chief Executive Tim Cook appeared at the launch of the Oxford Foundry business and tech incubator, and spoke for an hour to students of the university on his relationship with Steve Jobs, Apple's responsibility to customers, and what inspires him as the head of the company. Cook started talked about why he started working for Apple. Citing an early identity crisis personally and professionally, Cook realized as a young man that he didn't want to go the way of his father, and wanted to both enjoy what he did for a living, and "serve humanity, in a broad way." It was only well after joining Apple against the advice of his peers, that he found what he was looking for. Cook noted that focus groups don't work for Apple, because most people will suggest small changes to the existing thing are ideal, rather than larger sea changes to drive the industry and technology forward. "Your focus group is yourself. You should make products that you want to use", said Cook. "You can bet that if you love it, then there are many other people that will love it too." Apple retail was founded with keeping close to customers, Cook added, as listening to feedback from existing customers remains important to the company. As part of staying connected to customers, Cook said that he spends the first hour of his day going through customer emails. Apple's CEO looks to his customers for inspiration. "I look to heroes, and to how our products are used," said Cook. "Someone who is using the tools that we made to do something big in the world." Visiting Apple's customers and content producers is "better than any Prozac I can buy," quipped Cook. "Working with Steve was a privilege of a lifetime. Steve taught me that the joy was in the journey, and not in the final thing," Cook said, in response to a question about the Apple founder. "Steve taught me the importance of focus. You have to be ruthless in what you choose to be great at." Apple's present is firmly rooted in Jobs's founding principles added Cook, including the concept not shooting for the most sales of any one thing —even though it may happen along the way. "I don't think anyone is like him. I've always felt that Steve was not replaceable," said Cook. "I don't feel like I replaced him." "Steve, of every one I ever have known in life, could be the most avid proponent of one position," Cook reminisced about Jobs in a question about failure. "In hours or days if new information came up, you would think that he never, ever thought that before." As the question and answer session started, Cook was critical about companies selling out to Google, Facebook, or Apple as a matter of money generation. "If a venture capitalist ever asks you [about an exit plan]," Cook said. "You should get up and leave the room." Cook wasn't asked about future Apple products. When asked about future technologies like quantum computing, and other mostly hardware-related advancements, Cook reiterated his stance of augmented reality being a driving force for the future, and a technology he remains the most excited about. The Oxford Foundry will serve as Oxford's first dedicated space for entrepreneurial endeavors. The building, formerly an ice factory, sits at the center of Oxford's college city and has been transformed into a modern entrepreneurial hub with meeting rooms, free Wi-Fi and desk space for budding business teams. Oxford says The Foundry will provide students with access to support funds, host workshops, run competitions and hackathons, manage an e-library and more. Select startups can also take advantage of the Amersi Foundation Accelerator space. Students retain control of any intellectual property that they develop.